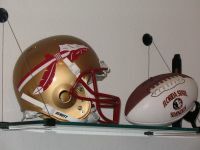 Florida State Seminoles helmet and ball. For nearly two decades of my professional life, I worked with junior and senior high school age youth. Of all the different duties related to this work, my favorite task was training peer counselors. The individuals chosen to be peer counselors were kids passionate about helping others. They took their training seriously and worked diligently to develop the appropriate skills to be exceptional peer counselors. One of the first activities in the training was each participant sharing their name and an explanation of how they got their name and/or what their name meant. Some knew very little about their name while others were able to go into great depth concerning their name. Part of this introduction included sharing nicknames, as well as what nicknames the individual liked and didn’t like. The exercise served two purposes. The first was to help participants get to know one another. The second was to demonstrate the significance of a name, the kind of power and meaning names can carry. This exercise was always an eye-opening experience for the kids. Most of the time, the majority of the group was unaware of the impact names have on an individual’s self-perception and group identification. The matter of names has always been significant for me. When I was younger, many of my school mates called me “Dumbo” because my ears were much larger and out of proportion with the rest of my head. Later, I was called “Tubby” because I was overweight. There were other nicknames that I didn’t like, and all of these nicknames have had a lasting impression on me and my self-image. In addition, name calling was a big part of my father’s disciplining tactics. He often called me “Sissy,” “Slow,” or “Dummy.” Today I understand that what he was trying to do was to challenge me, make me tougher. I also know that his approach was misguided, and perhaps abusive. However, gaining these insights has not made the pain any less, nor has it removed the stigma I still carry with me. We use names to label people, groups, and cultures. Names have the capacity to build someone up or tear them down. Names have the power to hold one captive and limit one’s sense of power or ability. In addition, names have the power to give one confidence and the courage to risk or tackle what appears as impossible. When I hear a man refer to his spouse or romantic partner as “the wife” or “the old lady,” I shiver and wonder if this person understands how he is depersonalizing his partner. When I am counseling couples, I pay close attention to how they refer to one another. Do they speak to one another using each other’s name, or do they more frequently refer to one another as “honey,” “sweetheart,” “baby,” and so forth. On the surface, such references sound endearing and loving, but these terms can also be depersonalizing, and rather than creating great intimacy, they instead build distance and separation. When I talk with the couples about this, the majority is surprised by this perspective, and some defiantly deny the concept. Either way, talking about one another’s name and the nicknames they use for one another opens to door to some much deeper meanings and feelings about how these two people view one another. This issue of names and labels has come back to forefront for me through current media discussions on colleges, universities, and professional sports teams changing their names when the current nickname of the team is a reference to Native Americans. I have heard everyone from Rush Limbaugh to Bob Costas to David Letterman comment on the particular matter of whether the Washington Redskins football team should change their name. A number of major media outlets no longer use the term Redskins when talking about the NFL franchise in Washington. What makes this matter is that it serves as a measuring stick of how far we have come as a society in recognizing when the use of a name is no longer appropriate. The matter of removing Native American names and images from sports teams has been with us since the 1970’s when Stanford changed their name from the Indians to the Cardinal (the color, not the bird). This change was dismissed by most as an act of one of those far left groups, and little attention was given to the matter. More recently, however, the NCAA has asked schools such as Florida State (Seminoles), North Dakota (Fighting Sioux), Illinois (Illini), and several other schools to change their name out of respect for Native Americans. More recently, the NFL has requested the owner of the Washington franchise to also consider changing its name. Those opposed to such a change talk about the historical nature of the name, how the name was never meant to cause offense, and that certain individuals are being too sensitive and politically correct. One commentator even suggested that polls be taken of Native Americans to see whether they are truly offended by the use of Native American tribal names in sports. However, these claims miss the point of making such a name change. As a society grows and matures, there is a recognition that certain understandings and perspectives change based on new information and knowledge. With this new knowledge, the society adjusts its previously held idea to align with the new learning. There is always some resistance to this process, but generally, the society makes these adaptations. Changing the name of a football team, especially one located in the nation’s capital, can serve as an acknowledgment that as a society we understand how the name “Redskins” carries negative connotations. From an existential humanistic point of view, names have a strong relationship to the concept of being a part of and being apart from. Names are very basic way of making one a part of something or some group, they can create a strong sense of inclusion and belonging. At the same time, names can be used to be apart from something, creating a clear boundary of where one starts and the other ends. The use of names as labels must be considered carefully and must be examined in light of what the current information and knowledge tells us about the use of a particular name. It would be a great symbolic act if the NFL Washington franchise would indeed change its name, and rid itself of a label that can and does offend some people because of their ethnicity and history. It is also very important that in our individual day-to-day lives, we look to rid our personal language of names and labels that constrict or depersonalize others…because the names we use matter.